So many things you can do with millefiori! Assorted Yellows..14-16mm Tropical Mix 8-10mm..NEW! Assorted Filigrana..5-6mm Citrus Mix..7-10mm..NEW! "Special Purchase" - These slices are cut from assorted Filigrana rods. Filigrana rods are clear glass, with the desired colored thread inside, fusing together. Turquoise Mix..7-10mm..NEW! Cherry Mix..7-10mm..NEW! 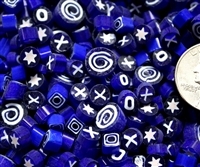 Blueberry Mix..7-10mm..NEW! Lemon Mix..7-10mm..NEW! Luscious transparent colors and a couple of bright opaques, perfect for mosaics! This is not your typical mix from the factory. This is a big mix of all of our assortments and all sizes. 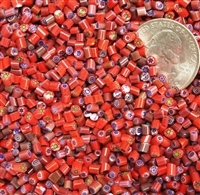 We take all factory mixes in all sizes and add our single colors to make the best assortment anywhere. It includes, flowers, hearts, circles, stars, star-bursts, crosses and even some geometrics in opaque and transparent colors. Note: Because so many colors and designs are in this mix its impossible to get all them in one bag. Every bag will be different. All of our millefiori is 104 coe unless noted. 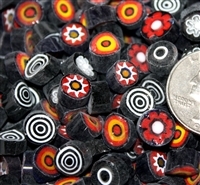 Assortment of select reds and black patterns including geometrics in stock excluding very tiny sizes. All color packs are blended here at Murano Millefiori using all designs we have in that color. This is a special purchase opaque assortment from a factory in Murano that has now gone out of business. Many of the patterns in the mix will never be made again. This is a specially made assortment from the factory in Murano. Many of the patterns in the mix are not available individually. This assortment of all brown/mocha patterns in stock excluding tiny sizes. This assortment of all white patterns in stock excluding tiny sizes. Assorted Aquas-New mix! Special Opaques Mix #9....8-10mm NEW! Special Transparents Mix #12....7-8mm NEW! Special Mix #18....5-6mm NEW! A new mix of aquas is now in stock! Refresh your browser to see new pic. All of our millefiori is coe 104. NEW! 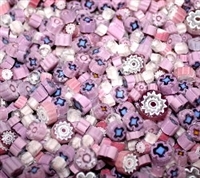 A special mix of 5-6mm patterns, not all patterns available individually. A new assortment of heart patterns some of which are not available individually. Almost out ~ Several different tiny blue patterns, many no available individually. A special factory mix of tiny 2-3mm patterns. 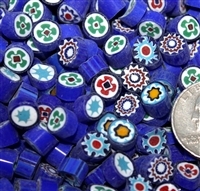 Tiny 3-4mm assortment of blue patterns not available in individual patterns. Assorted Blues Daisy Mix - 4 Sizes Mixed Daisy Trio Assortment Assorted Aquas-New mix! A classic daisy flower pattern hand mixed in 4 sizes.....3-4mm, 6-7mm, 8-10mm, and 10-12mm. Due to hand mixing, individual bags do not have equal quantities of each size. 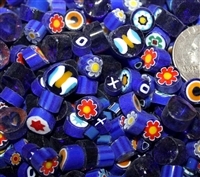 A new assortment of 3 different daisy patterns in several different sizes hand mixed here at Murano Millefiori. 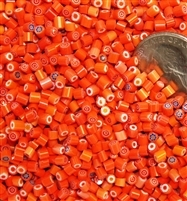 Patterns include U62(4-5mm,6-7mm), U56(4-5mm,7-8mm,8-10mm), and T55(4-5mm,8-10mm). Due to hand mixing, each package will not contain equal amounts of each pattern. All color packs are blended here at Murano Millefiori using all designs we have in that color. Because our stock changes often, the actual mix may vary from photo. All of our millefiori is coe 104. A factory assortment of orange patterns many not available in individually. The tiniest assortments of orange patterns that are made. Assortment of all pink patterns in stock excluding very tiny sizes. Assortment of all yellow patterns in stock excluding very tiny sizes. Flowers....Assorted Greens....2-3mm Multi Mix..7-10mm..NEW! 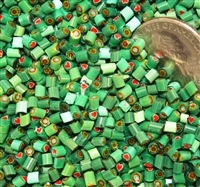 Assorted Greens..8-10mm Jubilee Mix..7-10mm..NEW! The tiniest assortment of green patterns that are made. 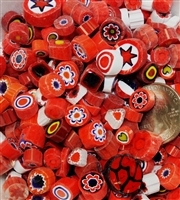 A mix of all of our specially priced new millefiori! Priced below our Italian millefiori. Shiny, smoothly polished, and sized 7-10mm. Luscious transparent colors, perfect for mosaics! This assortment of all green patterns in stock excluding tiny sizes. This assortment contains all of our red patterns in stock except for tiny sizes.